While pop culture has repeatedly tried to present the solar mirror as a weapon of mass destruction, every use found for it so far has been quite peaceful. The Mythbusters team even managed to disprove that Archimedes used this concept long ago to torch Roman ships, even though there is no doubt that he dabbled with the concept of focused solar rays. We might not have solar towers shooting death rays nowadays, but we do have a bunch of solar mirror inventions that come in handy. When we talk about solar mirrors, we refer to a simple combination of substrate and a reflective layer. The substrate is what shapes the mirror and provides structural integrity. Glass, though brittle, is commonly used as a substrate material. Metal can also be used to provide mechanical support. There are several options here with aluminium being the most popular. Aluminium can also be used as the reflective layer, but silver is still unmatched in its reflective capabilities. The two layers combined form a solar mirror capable of redirecting the solar rays from one place to another. Fine tuning of the reflection abilities can be achieved by adding a third interference layer between the two. The solar mirror is very useful if you wish to gather a bunch of solar rays in one spot. Some of the mirrors even have a curb that allows them to focus the reflected light in a single spot. Once you have the solar rays where you want them, you can do one of two things with the solar radiation. You can either produce heat or induce a photovoltaic effect. When you are just using the rays for heat, you are looking at a solar thermal application of the mirror. The concentrated solar power or CSP is directed to a heat engine and it uses it to produce electrical energy. On the other hand, you need a powerful photovoltaic cell if you want to use the sun’s radiation to directly produce electricity. Exposing any photovoltaic to light induces electrical current and adding CSP into the mix can only amplify the effect. Of course, to use CSP, you will need a special photovoltaic and an advanced cooling method. The solar thermal application is something that we can already see in many countries. Spain and the United States have several big fields covered in solar mirrors that are used to farm CSP. The solar thermal application offers a renewable source of energy that is even recommended by the US Department of Energy. If you examine the thermal applications in place, it is easy to conclude that there are several variations of the concept. These variations mainly differ in how the mirrors achieve maximum CSP. There is a great deal of science involved in getting the right mirror shape and adjusting its angle according to the Sun’s movement. The same mathematics will be helpful when the photovoltaic cells are finally used in large scale projects. So far, price has been a huge issue, but photovoltaic cells have become a lot cheaper in recent years. Concentrating radiation or heat does not sound to be that safe at all, especially considering that the whole process happens out in the open. However, the existing solar applications have proved that they are less harmful than our current sources of energy. Insects can fall victim to the alluring brightness of the concentrated light, but that is a small price to pay for an energy source that creates zero waste. Some scientists have voiced their concerns about the impact factor these ensembles have to the wildlife. Biologist Ed LaRue, when asked by National Geographic about his thoughts regarding the Mojave mirrors, stated, “Solar, especially at the level that it’s being proposed in the Mojave Desert, is a new threat.” However, later in the interview even he agrees that if placed in the right location, solar plants are one of the best choices we have. Discussing the future of the solar mirror entails a certain amount of speculation. Its future is closely tied to how it is likely to be used, and it is hard to make a long term prediction. So far, solar thermal application has been the way to go, but we are now beginning to see some major players like Google backing the photovoltaics. Depending on which one of these technologies prevails, the solar mirror can develop in different directions. What we can say for certain is that when we wake up tomorrow, the sun will still be shining. As long as we have this giant never-ending source of energy dangling in front of our noses, we will continue to invent new and better ways to harness it. CSP ensembles may have a small negative impact on the local environment, but on a global scale, they represent one of our best weapons in the fight against global warming. 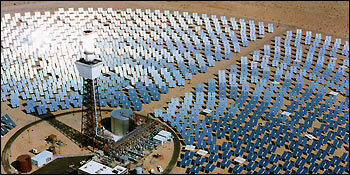 Tackling a huge issue like global warming will require a lot more solar mirrors than we have at this moment. In conclusion, the science behind the solar mirror might be easy to explain, but creating a mirror ensemble for a large scale project is more complex. As we burn off the last reserves of our fossil fuels, we will be compelled to research for the solar alternative. With more time and money spent on harvesting solar energy, seeing new and improved solar mirrors and innovative mirror ensembles will come as no surprise.